There is still the sea, it shall not be dried up. Photographs from that summer look like stills from a silent movie. 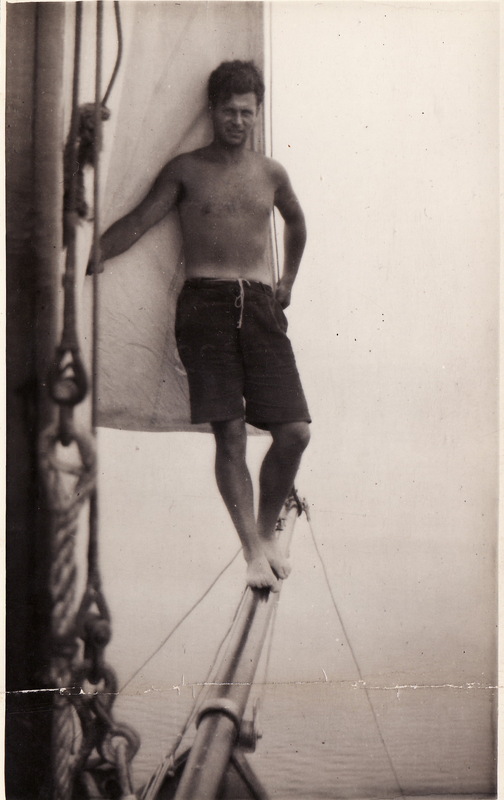 My father appears to be suspended in space, a happy marionette, in watery reflections and soft, billowing clouds, either dangling from a spar or balanced precariously on a bowsprit. There are no backgrounds, no recognizable features of landscape, just water and the hazy skies of western Scotland, the islands of Jura, Coll, Islay, Mull, and the blurred outlines of distant hills. He turned twenty-three on May 31, 1939, poor as a church mouse, but free to do whatever he liked, go wherever he liked. He rented rooms on Gare Loch and was as happy as he’d ever been, sailing the Clyde and swimming, reading Aeschylus in the original Greek with English annotations by Gilbert Murray, sitting up in his garret with an oil lamp flickering while unseen forces were already at work, plotting and reshaping his future.Through a small side window he could see the ships of the Royal Navy moored at the Tail O’ the Bank, making the words of Aeschylus seem all the more prescient: “Deep in that shingle strand, moored the sloops of war, and men thronged the beach of Ilium…” as if it were lifted from the front page of the Glasgow Herald but filtered through an ancient, amber lens. Clynder was little more than a post office with a church and a few houses clustered along Rosneath Road but the hills gave it a kind of grandeur, gathering up to the north of the village as they did, veiled in mist. There was no proper kitchen but he could cook sausages and beans on a little propane stove and he toasted bread in the fireplace. Sometimes, on rainy afternoons, he would go to Bremer’s Tea Room near the ferry pier and buy a scotch egg and wash it down with a cup of strong tea. When he wasn’t sailing, he was swimming Rhu Narrows to Blairvadach and back to the shingle beach at Shandon, or walking from his tiny flat on Brookend Brae, past the Presbyterian manse,across fields of slate and heather, past a greenhouse, a mossy weir, up Garelochhead Wood and a high, rain-streaked trail to Knockderry House on Loch Long. 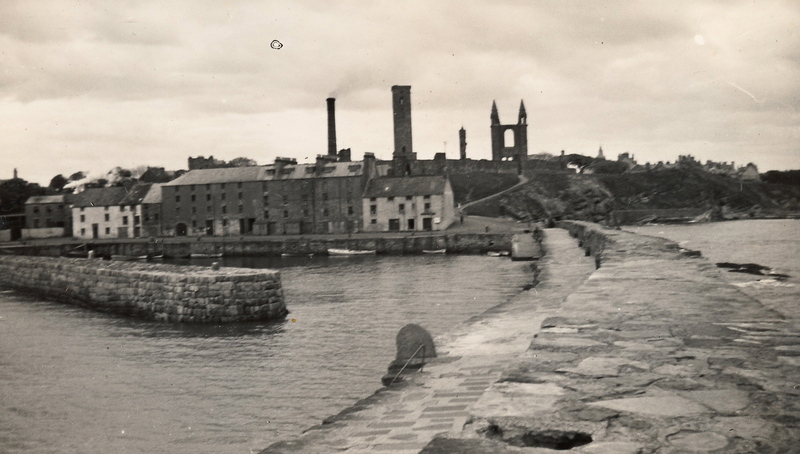 From there he looked across to Greenock, but already felt a world removed from his childhood on that distant shore. (He only went to visit his parents twice that summer.) In June, he went to a movie in Helensburgh: Goodbye Mr. Chips starring Greer Garson and Robert Donat. He also read Aldous Huxley’s new novel, After Many a Summer, about a Hollywood millionaire who fears his own impending death. 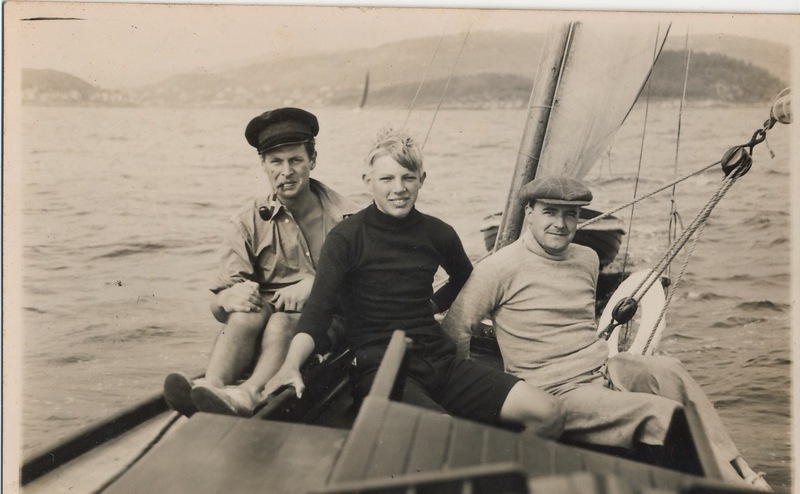 In another photo he’s been hoisted aloft and is clinging to the mast of a gaff-rigged yawl, looking young and agile while he doffs his cap, mugging for the photographer below. 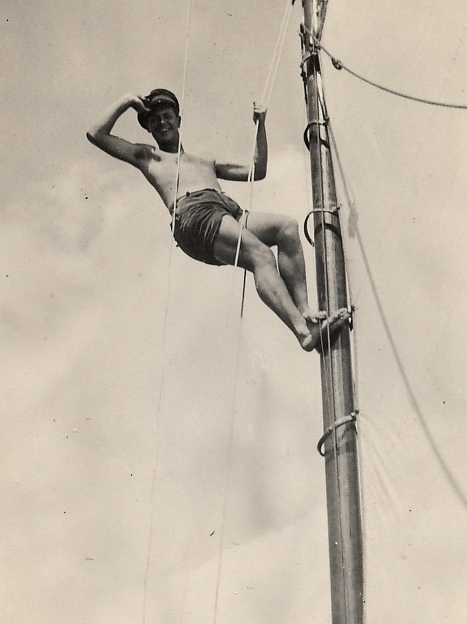 His right foot rests on one of the mast rings while his left hand clings to the halyard. His body is soft and supple, slightly overweight, but well proportioned and you can see how women must have been attracted, but there’s also something uncouth and wooly about him. 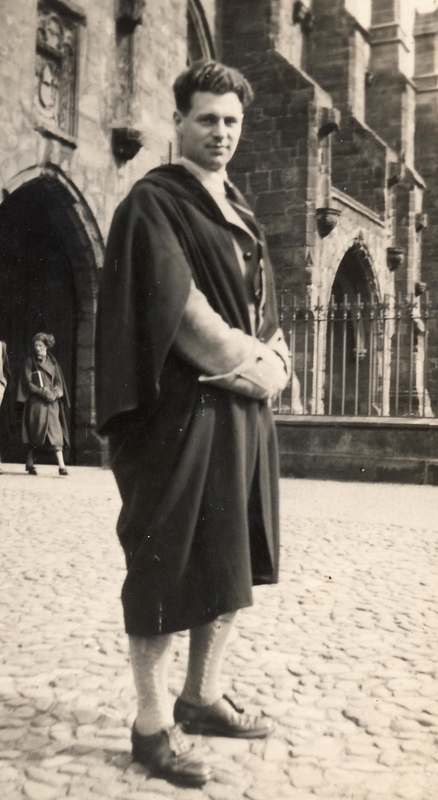 In another shot he’s wearing baggy black shorts and a velour shirt with a pattern of crowns and diamonds, Glasgow gangster style, and when I first came upon this photograph I thought it had to be someone else, certainly not my solemn Reverend Father. There was Rose in Colonsay and another–Maira?–when he crewed to the south of Ireland on Vagrant. The old Clyde Forty hit a nor’easter on the homeward leg and limped into Dublin for repairs . Later in July, he crewed on the 6-meter Circe, the Bermudan yawl Zigeneur and Dragon-class Primula. 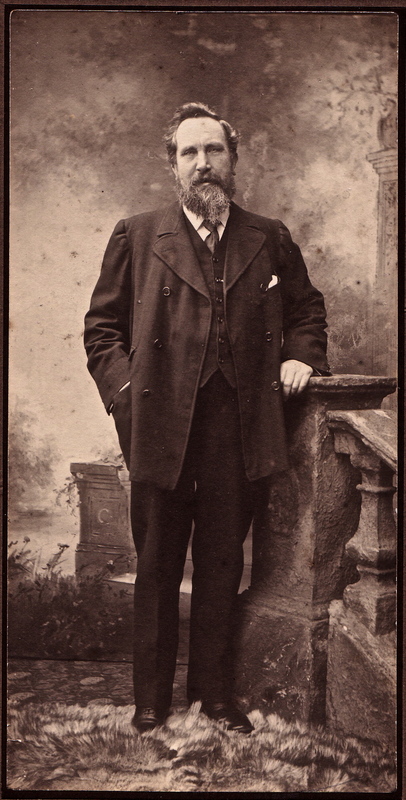 In early August, he earned ten pounds skippering a ketch up the west coast to Tobermory and out to the island of Muck, “seeking harbor by night in lochs protected by hills ancient with wisdom and offering a rare serenity to those ready to accept it,” he wrote, also mentioning a “beautiful redhead” who he’d met on the pier at Tobermory, but couldn’t remember her name–Ainsely? He wasn’t sure. On August 20, Germany announced that they’d reached a trade agreement with the Soviet Union. Two days after that, Prime Minister Chamberlain renewed Britain’s pledge of support for Poland, while appealing to Hitler for truce. But the worst was yet to come and on August 23, while Ernest was sailing Dionne to Cowes, seven hundred miles away, Germany and the Soviet Union signed their non-aggression pact, paving the way for the invasion of Poland, and as the summer drew to an end, he sensed that his days of lofty indolence were over, and marked a passage with red pencil in his copy of Aeschylus: “What is this insistent fear which in my prophetic heart set and steady beats with evil omen, chanting unbidden a brooding, oracular music? Why can I not cast it out like a dream of dark import?” But he could not cast out that brooding, oracular music from his heart, and he had no doubts that war was imminent and he would be killed. My mother, Helen Macintosh Robertson, was on board Dionne for the first leg of the Cowes Race, from Hunter’s Quay to Arran. She was the daughter of Alec Robertson and granddaughter of Alexander, the barrel-chested patriarch of the Robertson family and founder of the self-named yacht business based on the Holy Loch. (Alexander reached prominence in 1902 when he made overnight repairs to Kaiser Whilhelm’s yacht, Meteor III, and was thereafter rewarded with a commission to build the Kaiser’s next boat.) 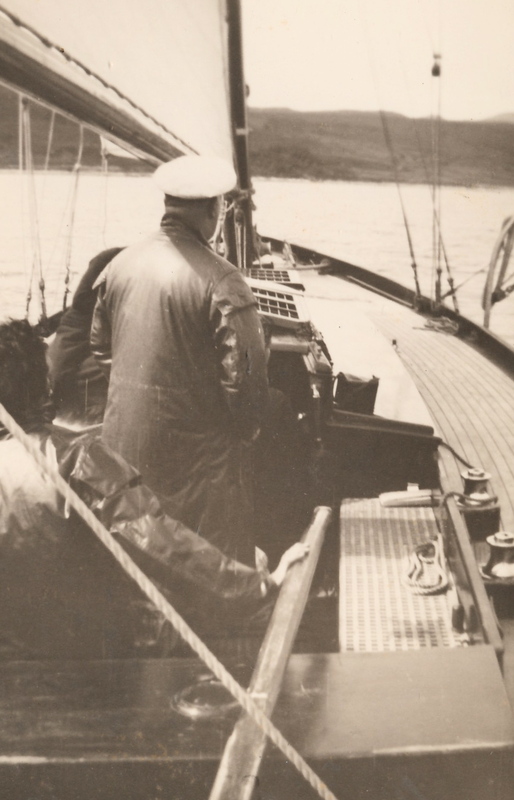 According to my mother, she and Ernest barely exchanged a word the whole time, my father standing on the foredeck, raising another jib while glancing aft to the willowy figure in black oilskin. There were dozens of handsome young men that summer, and she pretended not to notice the tanned, shirtless man in the bow. He remembered the way she chain-smoked and chatted madly in the cockpit, flirting with Sandy Garvie whose father owned Dionne. Maybe he’d been trying too hard to impress her, showing off, she scoffed. Who did he think he was in those shabby shorts and rope belt? “Common” was the word she used forty years after the fact, but he was also darkly handsome and tall and her calculated method of gaining his attention was to ignore him all the way to Arran. Dionne placed third in her class and won a bronze plaque. The Garvies put on a festive luncheon for the crew (cold lamb, shepherd’s pie, pickled onions) at the Royal Marine Hotel, a granite pile in Hunter’s Quay with Neo-Tudor gables overlooking the Clyde. Toasts were made all around and my father stayed until the end when everyone stood up to sing God Save the King just before it was announced, almost as an afterthought, that Germany had invaded Poland. After that, everything seemed to unravel and the lofty, loving summer of 1939 came to a rather sudden and squalid end. At one point he even considered making a career of moral philosophy. He wasn’t sure how that would work, but anything seemed possible during these idyllic pre-war days. He loved the Old Town, the students, the professors, the ancient golf course and the pristine strand of pale sand that stretched to the north. Again I don’t know much. He didn’t speak very often of these days, and if he did it was usually only a brief anecdote about rugby or drinking beer or saber fencing. 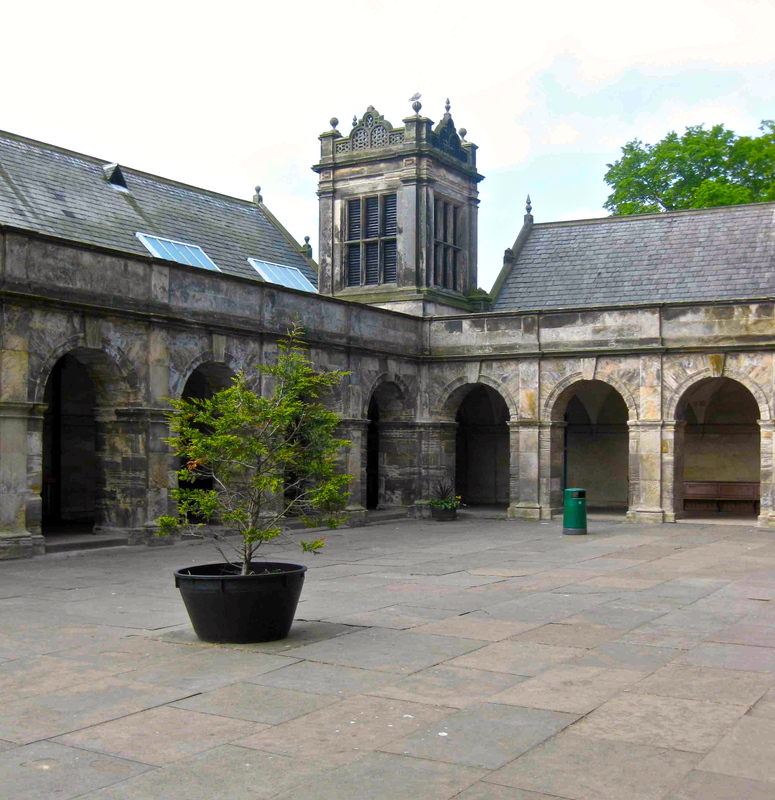 He once mentioned his friend Bill McLean who had also signed up for Officer Training Corps (OTC) and how they trekked through the soggy glens of western Fife on weekends dressed in their OTC uniforms of gray kilt, green shirt, long woolen socks, and leather boots. There’s a photograph of them, bivouacked in a field somewhere, lying in the heather, their fresh faces pointed towards the sun. I stroll down Largo Road to Nelson Street where Ernest leased student digs during that final semester before the war, and I follow the same path that he took every morning, past the lawn bowling club and up the well-trodden footpath that crosses Kinnes Burn and tunnels through Louden’s Close, a narrow wynd that passes between stone walls and beneath a low archway onto South Street, now bustling with students in medieval robes, laughing and going about their business. I try to imagine my father here in his crimson robes and thick curly hair, walking up Market Street to the eastern end of town, wandering through the 12th-Century ruins of the cathedral where the relics of Apostle Andrew–fisherman and brother of St. Peter–are said to be buried. Some of the walls are sill standing but most have collapsed and there’s a mossy bed of grass in place of the floor. It’s a garden puzzle of granite and empty spaces where the sky pushes in and the cruciform plan is still evident in the stones that remain. Bremer’s Tea Room is no longer there but the building where my father rented rooms is still in tact, a half-timbered boarding house called “Seasgair”, on Brookend Brae with white chickens out back, wire cages, straw and mud, a few plum trees, and a blackened stone wall with patches of moss and miniature ferns sprouting from its mortared seams. I park the car and try to follow the path that he used to take on his Sunday walks, past the manse, up through the woods and over the top of the hill to Loch Long. I go as far as a barbed-wire fence, and stop to look back across the village and the loch, trying to imagine him standing on this same hill, catching his breath, looking out on the same leaden light falling over the inlets of the Clyde that summer more than sixty years ago. His memories were fractured, disconnected, and I have to work with what I have, a few photographs, a few stories, something about the Loch Long Hotel and Sunday walks over Luss Ridge, the highest ridge. He would go for kedgeree with hard-boiled eggs and curried rice after church, on weekends, when there wasn’t a regatta.There used to be a small-gauge railway that stopped in Tarbert and sometimes, when tired from walking, he would ride it through Ardmay and Finnart, across the hills to Garelochhead, then get off in Rhu and take the ferry across Gare Loch to Rosneath and walk down Shore Road and back to his flat in Clynder. The Loch Long Hotel is still there, catering to bus tours, a cluster of white buildings running down to the sandy flats of Loin Water. I leave my car by the restaurant, and stand on a stone parapet. I can smell low tide wafting up from the muddy flats and kelp beds. A man is walking a Collie along the water’s edge. I head up the path through an orchard and along the edge of a pine forest with a stream that I could hear but couldn’t see–water gurgling, muffled by pine needles–until I was up to the weir where the hidden stream spilled into a small lake. Further up there was a keeper’s cottage with the Duke of Argyll’s crest emblazoned on the front gable. Straw had been laid out in bails beside a fence. I walk through an iron gate, careful to secure the latch after I’m through, and cross a small stone bridge. There are more trees at this altitude and I continue up an even steeper path that switches back and forth to the very highest part of the ridge where there’s a small pavilion with a bench and a glorious view to the west. It feels much wilder and remote than I expected, and the mountains appear to lift themselves up from their own reflections in the placid waters of the loch. Am I looking for my father’s past or is it something else, my own imprint in all of this? I’m not sure. At times it feels as if I’m chasing the flimsiest shadows through these lochs and glens: mysteries of seaweed, hake and haddock, plaited ferns along the shore, water lapping over gray shale, while across the way the clouds press down against the lower foothills. I suppose it’s the afternoon light and the wetness in the air, but the mood of the moment changes and there’s a downpour followed by a breeze that spreads fan-shaped ripples across the loch. A saturation of light hangs over the glen, and for a moment it feel as if the entire world were pulling back to the horizon–a general ebbing–as happens before a tsunami, the clouds hanging low and ribbed in dull streaks of purple like the cartilaginous underside of a skate’s wing. I think of the way my father would say, “Ochh...” in a weary, drawn out voice when something broke in his hands. Was this the bitter cry of his father or was it his own sense of disappointment? He often seemed unapproachable, disconnected from his own body, even when standing in a crowd of people, yet he was hyper-aware of immediate surroundings, aware of who was approaching, who was coming through the door, as if on the alert for a surprise attack. He would scold me for slurring my words and in the way of instruction would enunciate his own words slowly and distinctly like an old-fashioned radio announcer. In the summer he walked around the house naked, without the least bit of modesty. After swimming, he stood in the sun and sucked in his stomach while flexing his abdominal muscles in an undulating motion. He had black spots all over his neck and shoulders–moles, odd pigmentations and blotchy discolorations–from over-exposure to the tropical sun. He was good at grabbing moths in mid-flight and crushing them between his fingers. He preferred not to use toilet paper. He suffered dizzy spells, palpitations of the heart, black outs, fainting spells, and other after effects of malnutrition. He almost never fell into a deep, restful sleep, but would nod off in the living room with a hand draped on his face–his index finger crooked over one eyelid in a guarded way. Sometimes he woke with a start and lashed out, disoriented and confused. He was surprisingly clumsy, well beyond the average, big-man clumsiness. Whenever my father fell on the sidewalk, stumbled down a staircase, slipped on the ice, tripped over a carpet or cut his hand on the lid of a tin can or broke his thumb or accidentally put his hand through a window, it was always extreme, with blood, stitches, curses and ugly bruises that took weeks to heal. Sometimes my father would eat his food like a rapacious dog, stuffing meat or bread into his mouth, swallowing without chewing, jamming it down as if he was still afraid of starving. His favorite sandwich was ripened banana on whole wheat. When he ate an apple, he always ate the whole apple, including the core and seeds. After moving to America in the 1950s, he became even more Scottish in his actions and reactions. His West Highland accent grew stronger. He had his tweed jackets custom-tailored in Duddington Park and he polished his hand-stitched brogues with a special brush. He marched smartly along Prospect Street, nodding and saying “good afternoon” to every student who passed as if he were their commanding officer and they were his subalterns. The rain passes quickly but leaves a heaviness that lingers for the rest of the afternoon, made all the more poignant by the wind whispering through pine needles. I drive over the hills from Arrochar, along the old Military Road to Tarbet and south through Stuckgowan and Culay, along the tourist-crowded banks of Loch Lomond, through Rhu Wood and Strone Wood and into the village of Luss with its pretty parish church. By now, my head is aching so I stop for a cup of sweet tea at the little Glendarroch Tea Room, overlooking the spot where Luss Stream spills into the loch and leaves a swathe of pebbles in the spreading shallows. I sip my tea and watch the evening light sweep across the water, highlighting one of the little islands–Inchfad, or is it Inchmurrin?–to the opposite bank and the rising slopes of Rowardennan Forest, mythical place of fairies and changelings, the light turning the surface of the water into a spectral entity, skimming the upper reaches of Ballinjour Hill, dipping and cupping the heathery shadows, making the clouds appear wanton and unruly above the higher peaks. It’s late summer and I’ve been searching for missing threads to my father’s pre-war life, but all of those threads seem to unravel here and I find myself wondering why I bother. I’ve learned almost nothing that I didn’t already know, other than a feeling for the landscape and the fickle Highland light that shaped his moods during that pre-war summer. He kept everything compartmentalized and discrete. He hardly ever spoke about his mother or father. He hardly ever spoke about the years just before the war and that’s what makes it so hard to link up the disparate parts of his life and create a single, comprehensive portrait of the man. Sometimes I feel as if I’m on the right path, following his footsteps, reaching a clearing of some sort, and then the path peters out and I feel hopelessly lost. How many stone-bound fingers of sea cut into this broken coast? How many lochs? It’s hard to say but there are at least as many as the ancient inlets of the Aegean: Loch Long, Loch Goil, Lock Eck, Loch Striven, Loch Ridden, Loch Craignish, Loch Etive, Loch Spelve, Loch Sunart, Loch Shiel, Loch Arkaig, Loch Quoich… all the way up the coast from here to Durness, the sound of their names clashing together like claymores… Loch Slapin, Loch Cluanie, Loch Duich, Loch Shieldaig, Loch Assynt… Germany invades Poland on Friday, September 1, 1939. Two days later, Britain and France declare war on Germany. On Monday, September 4, Ernest packs up his little flat in Clynder and goes to his parents’ house in Toward. He remembers the feeling of being placeless, as if he’d fallen into the “ebb and flow of fate” that Aeschylus described in the Aeneid. The next morning he takes the bus to Dunoon and walks into the enlistment offices of the Argyll and Sutherland Highlanders on Moir Street. EG, at center: Argyll & Sultherland Highlander’s training exercise, near Stirling, Scotland, October 1939.
my father: Rev. Ernest Gordon (1916-2002).